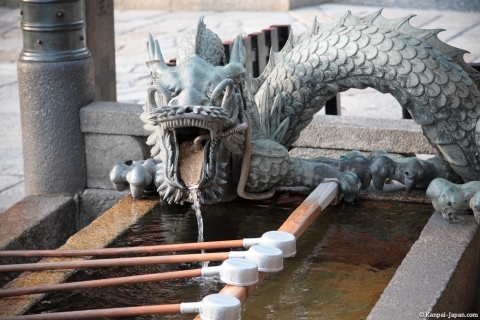 Kiёmizu-dera (清水寺, “Pure Water Temple”) – one of the most beautiful and revered temples in Japan. As a place for its construction were selected wooded hills in eastern Kyoto, near the waterfall Started, clean water which gave the temple its name to the future. Construction was completed in about 780 year. Originally the church belonged to the Buddhist school Hossa, but afterwards a new school was born within its walls – China Hoss (1965). Since 1994, the temple is part of the World Heritage List of UNESCO. 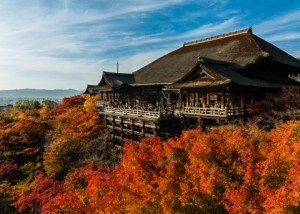 On the territory of Kiemidu-dera offers spectacular views of the surrounding forest temple, cherry orchards and maple trees. It is best to observe the picturesque scenery with a wooden veranda, to which you can go through the main hall. In the distance you can even see the city of Kyoto. Interestingly, the veranda, as well as the main hall of the temple itself, were built without a single nail. Inside is the main object of worship in Kiemidzudera – a small statue of the thousand-and odinnadtsatilikoy goddess Kannon. A little further from the main hall there is a RS & Sanctuary, dedicated to the goddess of love and marriage. Before entering the temple, at a distance of 18 meters from each other, are two stones. According to the old legend, if a person is unable to pass from one stone to another with their eyes closed, waiting for his luck in love. You can also ask someone to guide you along this route, but in this case, remember that you can find love only through the intervention of a third person. Near the base of the temple is Started waterfall. His flow is divided into three separate streams. 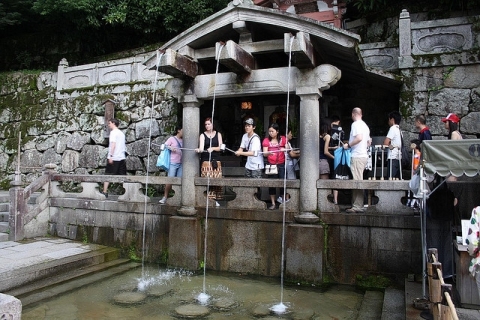 Visitors to the temple can drink water from a stream: it is necessary to go to a special area and using a cup attached to the poles, the water type to itself. According to legend, each stream has its own magical power, one gives longevity, other help in their studies, and the third gives love. But drinking just three sources is considered a sign of greed and stupidity. On the territory of the temple complex it is also Okunoin Hall, in many ways reminiscent of the main hall Kiemizu-dera, but smaller. There is also a terrace with scenic views. Near Okunoin are rooms dedicated to Shaka Buddha Amida Buddha and deity Jizo, the patron saint of children and strangers (in the temple of his large collection of stone statues). In the future, the southern part of the temple is a pagoda Koyasu, visit which, according to the old tradition, contributes to successful fertility. 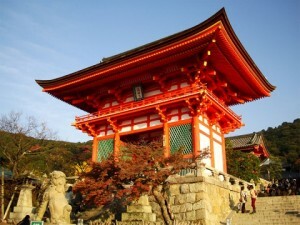 Not far from the entrance to Kiemizu-dera temple is located quite a few other buildings, including a bright red three-story pagoda, the big gates, sutra repository, and also Dzuigudo Hall dedicated to the Buddha’s mother. Particular attention should be paid towards Kiemizu-dera – winding streets and colorful atmfosfernogo district Higashiyama. In the local restaurants you can taste the special treats Kyoto, and in the shops to buy traditional souvenirs. 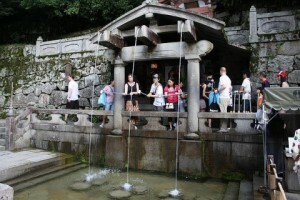 Before Kiemizu-dera temple can be reached from Kyoto station by bus №100 and №206 (15 minutes, 230 yen). Get off at the Gojo-zaka station or Kiyomizu-michi, here ten minutes walk up the hill towards the temple. Also, the church is a 20-minute walk from Kiyomizu-Gojo Station w / d Keihan line.